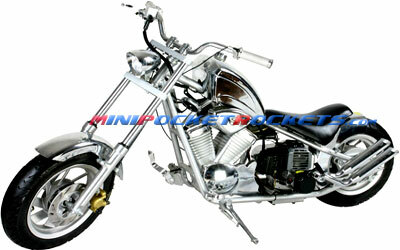 The Predator Mini Chopper is one heavily chromed-out bike with performance that matches its showy looks. Features include a heavily padded leatherette seat, V-Twin engine cover, dual chrome exhaust pipes, fully functional lights and horn. A sport-tuned suspension, hydraulic brake system, electric start, extra wide rear tire and a throaty exhaust note show that this mini chopper means business! The 49cc engine on this chopper was designed with bottom-end torque in mind. Turn the key in the ignition and this mini chopper comes to life. One twist of the throttle and your RPM will be climbing all the way to redline, firing its exhaust through the mandrel-bent piping. Stop on a dime with The Predator's state of the art dual-piston hydraulic brake and cross-drilled discs. The smooth handling, plush seat and laid-back riding position ensures hours of comfortable cruising. Adjustable handlebar angle, throttle / brake sensitivity and tire air pressure allows the mini chopper rider to fully customize this chopper for cruising. The Predator Mini Chopper comes almost fully assembled and also includes collapsible foot pegs and a retractable kickstand to park your bike. Included Free with Mini Chopper: Gas Mixture Bottle & Cap, Charger, 2 Sets of Keys, Fuses, Tools (sockets, screwdrivers, allen wrenches), Tool Case, Owner's Manual and our free extended warranty.